The electronic wireless meeting room booking system by using your existing calendar systems and improve and streamline your workflow. 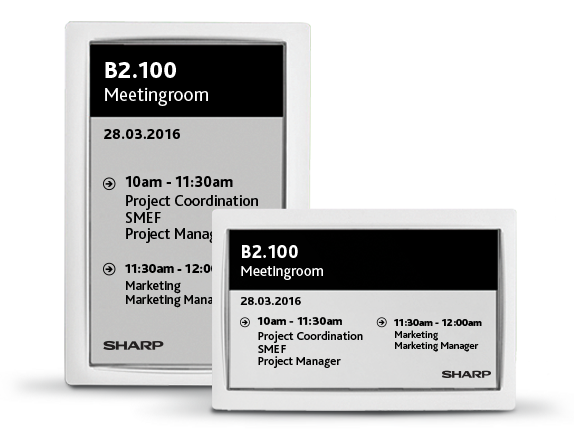 Make an impact on employees and visitors with our sleek screens and way-finding solutions installed in your office locations. Once installed, you will immediately start using your shared spaces more evidently. It will eliminate guesswork in corridors by displaying the accurate booking information right in front of the meeting room. Furthermore, its configurable touch panel allows you to book and release meeting rooms on the spot. Acepaq is distributor of major brands wireless meeting room reservation system in Dubai, UAE.Meeting room scheduling system is reduce meeting reservation headaches. Meeting room reservation system is the only cable-free solution dedicated to meeting rooms which truly scales for large deployments.It’s only a fingertip away. The meeting Room reservation system Manager is a beautiful screen solution for all your meeting rooms. Make sure they’re being used in a truly effective way. Forget about double bookings, confusion and interrupted meetings. Book conference rooms easily and then have all information presented on the screen. Integrates seamlessly with the existing e-mail server. Now you’ll get full insight into your organization’s meeting patterns to optimize resources. Get decision making support that really cuts costs. If you have room for improvement, get in touch with the Acepaq Room Manager. No cabling: – Simply stick the display on glass, wood or stone surfaces, using double sided tape. No need to cable anything. Wi-Fi connected: – It will connect to your existing Wi-Fi network, no need to install anything else. OPEN, WEP, WPA2 and WPA2 Enterprise are supported. 2 years of autonomy: -A display is extremely power efficient. It will run more than 2 years on a single small battery that can easily be replaced. Secure: – Secure communication protocols and encryption. Plus, with our on-premise server solution, your data is kept inside your own network. High quality display: -A large 8″ paper-like display with great readability over the full 180° viewing angle, covered by a high-quality float glass. Configurable: -Choose a template from our library. Evoko system Configure what features you want on your display. MS Exchange, Office 365 and Google colander. meeting room scheduling system can customizable.